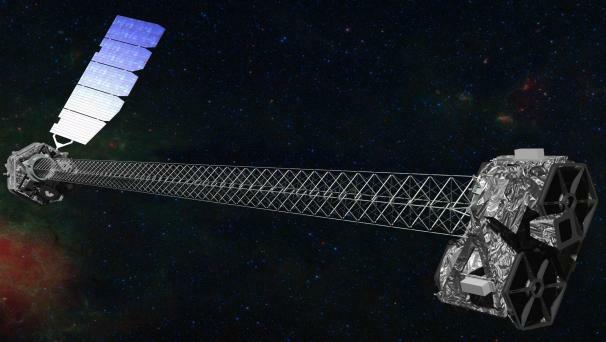 On May 30th at 10am Pacific (that’s 1pm for you East Coast folks), NASA held a news conference to talk about NuSTAR, the Nuclear Spectroscopic Telescope Array that is being deployed in June to hunt for black holes. As amazing as the NuSTAR itself is, NASA’s decision to livestream the event via Ustream with moderated chat--as well as field questions from Twitter (hashtag #AskNASA)--made this an important event to pay attention to. If you missed the livestream, you can check it out on Ustream, as well as looking at other JPL events and media. NASA also published a photostream of the event for your perusal. NuSTAR itself is a joint effort that’s created a much more sensitive and far-seeing telescope than anyone’s ever put into space. Its mission is pretty ambitious: To study black holes like never before, measure high-energy X-rays, and take a peek at ultra-dense neutron stars. All three of these areas of research are the cutting edge of planetary science and space exploration. The focus of the NuSTAR will be how exactly galaxies and black holes coexist and develop together over a span of time. NASA’s use of social media to educate and engage people isn’t exactly new; in April of this year, NASA’s Social Media Team received the Space Foundation’s Douglas S. Morrow Public Outreach Award, which is given for significant contributions to public awareness and understanding of space programs. NASA also maintains a presence on Twitter, Facebook, Google+, Ustream, YouTube, Flickr, and a host of other social media sites. What’s important, though, is public awareness of what exactly NASA is doing and how it’s doing it. NASA recently went through a rash of funding cuts for research and exploration of space, giving rise to companies like SpaceX, which successfully docked its Dragon capsule to the International Space Station. A public forum to discuss a mission and its goals is an impressive way to utilize the Internet as a resource tool for education. As NASA transforms from a government agency to a social media-savvy space exploration company working globally to achieve the next generation’s exploration of the galaxy, we’ll all be able to follow along and contribute to the research. The future’s never been more exciting. Where were you on May 30th? Did you catch the stream, or follow #AskNASA on Twitter? You can see many of the questions fielded by checking out the hashtag on Twitter.